All-inclusive starting price for a base model 2019 MINI Cooper 3 door is $26,220.00, which includes MSRP ($23,090.00), Freight/PDI ($2,275.00), retailer administration fee (up to $599.00), MVIC fee ($140.00), tire stewardship fee ($16.00), and A/C levy ($100.00). **Lease example: Selling price of a 2019 MINI Cooper 3 door is $24,965.00, which includes MSRP ($23,090.00) and Freight/PDI ($2,275.00), less credit ($400.00), at 1.99 % APR for 48 months. Monthly lease payment is $301.38 with $1,025.00 down payment. First month’s lease payment, security deposit of approximately one month’s payment, retailer administration fee (up to $599.00), MVIC fee ($140.00), A/C levy ($100.00), tire stewardship fee ($16.00), fees associated with PPSA ($89.73), licensing, registration and applicable taxes are extra and due on signing. Total obligation is $16,737.31 plus tax. The residual value of the vehicle at end of term is $10,852.30. Annual kilometers limited to 16,000. $0.15 per excess kilometer. Excess wear-and-tear charges may apply. ***Finance example: Selling price of a 2019 MINI Cooper 3 door is $24,965.00, which includes MSRP ($23,090.00) and Freight/PDI ($2,275.00), less credit ($400.00), at 0.99 % APR for 60 months requires 120 bi-weekly payments of $192.57 with $550.00 down payment. Cost of borrowing is $2,494.32. Total obligation is $25,584.32. License, registration and taxes are extra and due on signing. ****MSRP starting price for a base model 2019 MINI Cooper 3 door is $23,090.00. Freight/PDI ($2,275.00), retailer administration fee (up to $599.00), MVIC fee ($140.00), tire stewardship fee ($16.00), and A/C levy ($100.00) are extra. All-inclusive starting price for a base model 2019 MINI Cooper S 3 door is $30,520.00, which includes MSRP ($27,390.00), Freight/PDI ($2,275.00), retailer administration fee (up to $599.00), MVIC fee ($140.00), tire stewardship fee ($16.00), and A/C levy ($100.00). **Lease example: Selling price of a 2019 MINI Cooper S 3 door is $29,165.00, which includes MSRP ($27,390.00) and Freight/PDI ($2,275.00), less credit ($500.00), at 1.99 % APR for 48 months. Monthly lease payment is $367.67 with $550.00 down payment. First month’s lease payment, security deposit of approximately one month’s payment, retailer administration fee (up to $599.00), MVIC fee ($140.00), A/C levy ($100.00), tire stewardship fee ($16.00), fees associated with PPSA ($89.73), licensing, registration and applicable taxes are extra and due on signing. Total obligation is $19,510.80 plus tax. The residual value of the vehicle at end of term is $12,599.40. Annual kilometers limited to 16,000. $0.15 per excess kilometer. Excess wear-and-tear charges may apply. ***Finance example: Selling price of a 2019 MINI Cooper S 3 door is $29,165.00, which includes MSRP ($27,390.00) and Freight/PDI ($2,275.00), less credit ($500.00), at 0.99 % APR for 60 months requires 120 bi-weekly payments of $221.36 with $1,100.00 down payment. Cost of borrowing is $2,486.91. Total obligation is $29,876.91. License, registration and taxes are extra and due on signing. ****MSRP starting price for a base model 2019 MINI Cooper S 3 door is $27,390.00. Freight/PDI ($2,275.00), retailer administration fee (up to $599.00), MVIC fee ($140.00), tire stewardship fee ($16.00), and A/C levy ($100.00) are extra. All-inclusive starting price for a base model 2019 MINI John Cooper Works 3 door is $38,020.00, which includes MSRP ($34,890.00), Freight/PDI ($2,275.00), retailer administration fee (up to $599.00), MVIC fee ($140.00), tire stewardship fee ($16.00), and A/C levy ($100.00). **Lease example: Selling price of a 2019 MINI John Cooper Works 3 door is $36,415.00, which includes MSRP ($34,890.00) and Freight/PDI ($2,275.00), less credit ($750.00), at 1.99 % APR for 48 months. Monthly lease payment is $453.99 with $950.00 down payment. First month’s lease payment, security deposit of approximately one month’s payment, retailer administration fee (up to $599.00), MVIC fee ($140.00), A/C levy ($100.00), tire stewardship fee ($16.00), fees associated with PPSA ($89.73), licensing, registration and applicable taxes are extra and due on signing. Total obligation is $24,140.28 plus tax. The residual value of the vehicle at end of term is $15,700.50. Annual kilometers limited to 16,000. $0.15 per excess kilometer. Excess wear-and-tear charges may apply. ***Finance example: Selling price of a 2019 MINI John Cooper Works 3 door is $36,415.00, which includes MSRP ($34,890.00) and Freight/PDI ($2,275.00), less credit ($750.00), at 0.99 % APR for 60 months requires 120 bi-weekly payments of $283.28 with $500.00 down payment. Cost of borrowing is $2,436.04. Total obligation is $37,326.04. License, registration and taxes are extra and due on signing. ****MSRP starting price for a base model 2019 MINI John Cooper Works 3 door is $34,890.00. Freight/PDI ($2,275.00), retailer administration fee (up to $599.00), MVIC fee ($140.00), tire stewardship fee ($16.00), and A/C levy ($100.00) are extra. All-inclusive starting price for a base model 2019 MINI Cooper Convertible is $32,820.00, which includes MSRP ($29,690.00), Freight/PDI ($2,275.00), retailer administration fee (up to $599.00), MVIC fee ($140.00), tire stewardship fee ($16.00), and A/C levy ($100.00). **Lease example: Selling price of a 2019 MINI Cooper Convertible is $31,965.00, which includes MSRP ($29,690.00) and Freight/PDI ($2,275.00), at 1.99 % APR for 48 months. Monthly lease payment is $377.46 with $550.00 down payment. First month’s lease payment, security deposit of approximately one month’s payment, retailer administration fee (up to $599.00), MVIC fee ($140.00), A/C levy ($100.00), tire stewardship fee ($16.00), fees associated with PPSA ($89.73), licensing, registration and applicable taxes are extra and due on signing. Total obligation is $19,990.28 plus tax. The residual value of the vehicle at end of term is $15,141.90. Annual kilometers limited to 16,000. $0.15 per excess kilometer. Excess wear-and-tear charges may apply. ***Finance example: Selling price of a 2019 MINI Cooper Convertible is $31,965.00, which includes MSRP ($29,690.00) and Freight/PDI ($2,275.00), at 0.99 % APR for 60 months requires 120 bi-weekly payments of $244.63 with $950.00 down payment. Cost of borrowing is $3,061.74. Total obligation is $32,751.74. License, registration and taxes are extra and due on signing. ****MSRP starting price for a base model 2019 MINI Cooper Convertible is $29,690.00. Freight/PDI ($2,275.00), retailer administration fee (up to $599.00), MVIC fee ($140.00), tire stewardship fee ($16.00), and A/C levy ($100.00) are extra. All-inclusive starting price for a base model 2019 MINI Cooper S Convertible is $37,120.00, which includes MSRP ($33,990.00), Freight/PDI ($2,275.00), retailer administration fee (up to $599.00), MVIC fee ($140.00), tire stewardship fee ($16.00), and A/C levy ($100.00). **Lease example: Selling price of a 2019 MINI Cooper S Convertible is $36,265.00, which includes MSRP ($33,990.00) and Freight/PDI ($2,275.00), at 1.99 % APR for 48 months. Monthly lease payment is $419.44 with $1,200.00 down payment. First month’s lease payment, security deposit of approximately one month’s payment, retailer administration fee (up to $599.00), MVIC fee ($140.00), A/C levy ($100.00), tire stewardship fee ($16.00), fees associated with PPSA ($89.73), licensing, registration and applicable taxes are extra and due on signing. Total obligation is $22,697.28 plus tax. The residual value of the vehicle at end of term is $16,995.00. Annual kilometers limited to 16,000. $0.15 per excess kilometer. Excess wear-and-tear charges may apply. ***Finance example: Selling price of a 2019 MINI Cooper S Convertible is $36,265.00, which includes MSRP ($33,990.00) and Freight/PDI ($2,275.00), at 0.99 % APR for 60 months requires 120 bi-weekly payments of $279.73 with $800.00 down payment. Cost of borrowing is $3,174.62. Total obligation is $37,164.62. License, registration and taxes are extra and due on signing. ****MSRP starting price for a base model 2019 MINI Cooper S Convertible is $33,990.00. Freight/PDI ($2,275.00), retailer administration fee (up to $599.00), MVIC fee ($140.00), tire stewardship fee ($16.00), and A/C levy ($100.00) are extra. All-inclusive starting price for a base model 2019 MINI John Cooper Works Convertible is $44,620.00, which includes MSRP ($41,490.00), Freight/PDI ($2,275.00), retailer administration fee (up to $599.00), MVIC fee ($140.00), tire stewardship fee ($16.00), and A/C levy ($100.00). **Lease example: Selling price of a 2019 MINI John Cooper Works Convertible is $43,765.00, which includes MSRP ($41,490.00) and Freight/PDI ($2,275.00), at 1.99 % APR for 48 months. Monthly lease payment is $530.31 with $500.00 down payment. First month’s lease payment, security deposit of approximately one month’s payment, retailer administration fee (up to $599.00), MVIC fee ($140.00), A/C levy ($100.00), tire stewardship fee ($16.00), fees associated with PPSA ($89.73), licensing, registration and applicable taxes are extra and due on signing. Total obligation is $27,429.92 plus tax. The residual value of the vehicle at end of term is $20,330.10. Annual kilometers limited to 16,000. $0.15 per excess kilometer. Excess wear-and-tear charges may apply. ***Finance example: Selling price of a 2019 MINI John Cooper Works Convertible is $43,765.00, which includes MSRP ($41,490.00) and Freight/PDI ($2,275.00), at 0.99 % APR for 60 months requires 120 bi-weekly payments of $338.88 with $800.00 down payment. Cost of borrowing is $3,364.87. Total obligation is $44,854.87. License, registration and taxes are extra and due on signing. ****MSRP starting price for a base model 2019 MINI John Cooper Works Convertible is $41,490.00. Freight/PDI ($2,275.00), retailer administration fee (up to $599.00), MVIC fee ($140.00), tire stewardship fee ($16.00), and A/C levy ($100.00) are extra. **Lease example: Selling price of a 2019 MINI Cooper Countryman ALL4 is $32,865.00, which includes MSRP ($31,090.00) and Freight/PDI ($2,275.00), less credit ($500.00), at 1.99 % APR for 48 months. Monthly lease payment is $390.50 with $1,050.00 down payment. First month’s lease payment, security deposit of approximately one month’s payment, retailer administration fee (up to $599.00), MVIC fee ($140.00), A/C levy ($100.00), tire stewardship fee ($16.00), fees associated with PPSA ($89.73), licensing, registration and applicable taxes are extra and due on signing. Total obligation is $21,129.04 plus tax. The residual value of the vehicle at end of term is $14,923.20. Annual kilometers limited to 16,000. $0.15 per excess kilometer. Excess wear-and-tear charges may apply. ****MSRP starting price for a base model 2019 MINI Cooper Countryman ALL4 is $31,090.00. Freight/PDI ($2,275.00), retailer administration fee (up to $599.00), MVIC fee ($140.00), tire stewardship fee ($16.00), and A/C levy ($100.00) are extra. All-inclusive starting price for a base model 2019 MINI Cooper S Countryman ALL4 is $37,220.00, which includes MSRP ($34,090.00), Freight/PDI ($2,275.00), retailer administration fee (up to $599.00), MVIC fee ($140.00), tire stewardship fee ($16.00), and A/C levy ($100.00). **Lease example: Selling price of a 2019 MINI Cooper S Countryman ALL4 is $35,765.00, which includes MSRP ($34,090.00) and Freight/PDI ($2,275.00), less credit ($600.00), at 1.99 % APR for 48 months. Monthly lease payment is $427.74 with $900.00 down payment. First month’s lease payment, security deposit of approximately one month’s payment, retailer administration fee (up to $599.00), MVIC fee ($140.00), A/C levy ($100.00), tire stewardship fee ($16.00), fees associated with PPSA ($89.73), licensing, registration and applicable taxes are extra and due on signing. Total obligation is $22,804.21 plus tax. The residual value of the vehicle at end of term is $16,363.20. Annual kilometers limited to 16,000. $0.15 per excess kilometer. Excess wear-and-tear charges may apply. ***Finance example: Selling price of a 2019 MINI Cooper S Countryman ALL4 is $35,765.00, which includes MSRP ($34,090.00) and Freight/PDI ($2,275.00), less credit ($600.00), at 0.99 % APR for 60 months requires 120 bi-weekly payments of $276.18 with $750.00 down payment. Cost of borrowing is $2,563.21. Total obligation is $36,653.21. License, registration and taxes are extra and due on signing. ****MSRP starting price for a base model 2019 MINI Cooper S Countryman ALL4 is $34,090.00. Freight/PDI ($2,275.00), retailer administration fee (up to $599.00), MVIC fee ($140.00), tire stewardship fee ($16.00), and A/C levy ($100.00) are extra. All-inclusive starting price for a base model 2019 MINI John Cooper Works Countryman ALL4 is $42,920.00, which includes MSRP ($39,790.00), Freight/PDI ($2,275.00), retailer administration fee (up to $599.00), MVIC fee ($140.00), tire stewardship fee ($16.00), and A/C levy ($100.00). **Lease example: Selling price of a 2019 MINI John Cooper Works Countryman ALL4 is $40,565.00, which includes MSRP ($39,790.00) and Freight/PDI ($2,275.00), less credit ($1,500.00), at 1.99 % APR for 48 months. Monthly lease payment is $476.97 with $900.00 down payment. First month’s lease payment, security deposit of approximately one month’s payment, retailer administration fee (up to $599.00), MVIC fee ($140.00), A/C levy ($100.00), tire stewardship fee ($16.00), fees associated with PPSA ($89.73), licensing, registration and applicable taxes are extra and due on signing. Total obligation is $25,216.24 plus tax. The residual value of the vehicle at end of term is $19,099.20. Annual kilometers limited to 16,000. $0.15 per excess kilometer. Excess wear-and-tear charges may apply. ***Finance example: Selling price of a 2019 MINI John Cooper Works Countryman ALL4 is $40,565.00, which includes MSRP ($39,790.00) and Freight/PDI ($2,275.00), less credit ($1,500.00), at 0.99 % APR for 60 months requires 120 bi-weekly payments of $313.64 with $800.00 down payment. Cost of borrowing is $1,783.70. Total obligation is $41,573.70. License, registration and taxes are extra and due on signing. ****MSRP starting price for a base model 2019 MINI John Cooper Works Countryman ALL4 is $39,790.00. Freight/PDI ($2,275.00), retailer administration fee (up to $599.00), MVIC fee ($140.00), tire stewardship fee ($16.00), and A/C levy ($100.00) are extra. All-inclusive starting price for a base model 2019 MINI Cooper 5 door is $27,520.00, which includes MSRP ($24,390.00), Freight/PDI ($2,275.00), retailer administration fee (up to $599.00), MVIC fee ($140.00), tire stewardship fee ($16.00), and A/C levy ($100.00). **Lease example: Selling price of a 2019 MINI Cooper 5 door is $26,265.00, which includes MSRP ($24,390.00) and Freight/PDI ($2,275.00), less credit ($400.00), at 1.99 % APR for 48 months. Monthly lease payment is $323.81 with $725.00 down payment. First month’s lease payment, security deposit of approximately one month’s payment, retailer administration fee (up to $599.00), MVIC fee ($140.00), A/C levy ($100.00), tire stewardship fee ($16.00), fees associated with PPSA ($89.73), licensing, registration and applicable taxes are extra and due on signing. Total obligation is $17,536.29 plus tax. The residual value of the vehicle at end of term is $11,463.30. Annual kilometers limited to 16,000. $0.15 per excess kilometer. Excess wear-and-tear charges may apply. 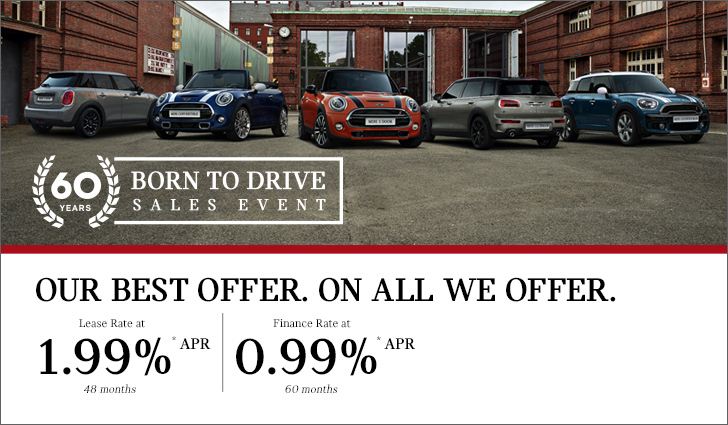 ***Finance example: Selling price of a 2019 MINI Cooper 5 door is $26,265.00, which includes MSRP ($24,390.00) and Freight/PDI ($2,275.00), less credit ($400.00), at 0.99 % APR for 60 months requires 120 bi-weekly payments of $200.06 with $900.00 down payment. Cost of borrowing is $2,518.42. Total obligation is $26,908.42. License, registration and taxes are extra and due on signing. ****MSRP starting price for a base model 2019 MINI Cooper 5 door is $24,390.00. Freight/PDI ($2,275.00), retailer administration fee (up to $599.00), MVIC fee ($140.00), tire stewardship fee ($16.00), and A/C levy ($100.00) are extra. All-inclusive starting price for a base model 2019 MINI Cooper S 5 door is $31,820.00, which includes MSRP ($28,690.00), Freight/PDI ($2,275.00), retailer administration fee (up to $599.00), MVIC fee ($140.00), tire stewardship fee ($16.00), and A/C levy ($100.00). **Lease example: Selling price of a 2019 MINI Cooper S 5 door is $30,465.00, which includes MSRP ($28,690.00) and Freight/PDI ($2,275.00), less credit ($500.00), at 1.99 % APR for 48 months. Monthly lease payment is $377.37 with $850.00 down payment. First month’s lease payment, security deposit of approximately one month’s payment, retailer administration fee (up to $599.00), MVIC fee ($140.00), A/C levy ($100.00), tire stewardship fee ($16.00), fees associated with PPSA ($89.73), licensing, registration and applicable taxes are extra and due on signing. Total obligation is $20,285.86 plus tax. The residual value of the vehicle at end of term is $13,197.40. Annual kilometers limited to 16,000. $0.15 per excess kilometer. Excess wear-and-tear charges may apply. ***Finance example: Selling price of a 2019 MINI Cooper S 5 door is $30,465.00, which includes MSRP ($28,690.00) and Freight/PDI ($2,275.00), less credit ($500.00), at 0.99 % APR for 60 months requires 120 bi-weekly payments of $234.77 with $700.00 down payment. Cost of borrowing is $2,530.04. Total obligation is $31,220.04. License, registration and taxes are extra and due on signing. ****MSRP starting price for a base model 2019 MINI Cooper S 5 door is $28,690.00. Freight/PDI ($2,275.00), retailer administration fee (up to $599.00), MVIC fee ($140.00), tire stewardship fee ($16.00), and A/C levy ($100.00) are extra. All-inclusive starting price for a base model 2019 MINI Cooper Clubman ALL4 is $31,820.00, which includes MSRP ($28,690.00), Freight/PDI ($2,275.00), retailer administration fee (up to $599.00), MVIC fee ($140.00), tire stewardship fee ($16.00), and A/C levy ($100.00). **Lease example: Selling price of a 2019 MINI Cooper Clubman ALL4 is $30,465.00, which includes MSRP ($28,690.00) and Freight/PDI ($2,275.00), less credit ($500.00), at 1.99 % APR for 48 months. Monthly lease payment is $367.52 with $775.00 down payment. First month’s lease payment, security deposit of approximately one month’s payment, retailer administration fee (up to $599.00), MVIC fee ($140.00), A/C levy ($100.00), tire stewardship fee ($16.00), fees associated with PPSA ($89.73), licensing, registration and applicable taxes are extra and due on signing. Total obligation is $19,728.14 plus tax. The residual value of the vehicle at end of term is $13,771.20. Annual kilometers limited to 16,000. $0.15 per excess kilometer. Excess wear-and-tear charges may apply. ***Finance example: Selling price of a 2019 MINI Cooper Clubman ALL4 is $30,465.00, which includes MSRP ($28,690.00) and Freight/PDI ($2,275.00), less credit ($500.00), at 0.99 % APR for 60 months requires 120 bi-weekly payments of $233.59 with $850.00 down payment. Cost of borrowing is $2,526.23. Total obligation is $31,216.23. License, registration and taxes are extra and due on signing. ****MSRP starting price for a base model 2019 MINI Cooper Clubman ALL4 is $28,690.00. Freight/PDI ($2,275.00), retailer administration fee (up to $599.00), MVIC fee ($140.00), tire stewardship fee ($16.00), and A/C levy ($100.00) are extra. All-inclusive starting price for a base model 2019 MINI Cooper S Clubman ALL4 is $34,820.00, which includes MSRP ($31,690.00), Freight/PDI ($2,275.00), retailer administration fee (up to $599.00), MVIC fee ($140.00), tire stewardship fee ($16.00), and A/C levy ($100.00). **Lease example: Selling price of a 2019 MINI Cooper S Clubman ALL4 is $33,365.00, which includes MSRP ($31,690.00) and Freight/PDI ($2,275.00), less credit ($600.00), at 1.99 % APR for 48 months. Monthly lease payment is $399.89 with $850.00 down payment. First month’s lease payment, security deposit of approximately one month’s payment, retailer administration fee (up to $599.00), MVIC fee ($140.00), A/C levy ($100.00), tire stewardship fee ($16.00), fees associated with PPSA ($89.73), licensing, registration and applicable taxes are extra and due on signing. Total obligation is $21,389.57 plus tax. The residual value of the vehicle at end of term is $15,211.20. Annual kilometers limited to 16,000. $0.15 per excess kilometer. Excess wear-and-tear charges may apply. ***Finance example: Selling price of a 2019 MINI Cooper S Clubman ALL4 is $33,365.00, which includes MSRP ($31,690.00) and Freight/PDI ($2,275.00), less credit ($600.00), at 0.99 % APR for 60 months requires 120 bi-weekly payments of $260.01 with $400.00 down payment. Cost of borrowing is $2,511.21. Total obligation is $34,201.21. License, registration and taxes are extra and due on signing. ****MSRP starting price for a base model 2019 MINI Cooper S Clubman ALL4 is $31,690.00. Freight/PDI ($2,275.00), retailer administration fee (up to $599.00), MVIC fee ($140.00), tire stewardship fee ($16.00), and A/C levy ($100.00) are extra. All-inclusive starting price for a base model 2019 MINI John Cooper Works Clubman ALL4 is $41,320.00, which includes MSRP ($38,190.00), Freight/PDI ($2,275.00), retailer administration fee (up to $599.00), MVIC fee ($140.00), tire stewardship fee ($16.00), and A/C levy ($100.00). **Lease example: Selling price of a 2019 MINI John Cooper Works Clubman ALL4 is $38,965.00, which includes MSRP ($38,190.00) and Freight/PDI ($2,275.00), less credit ($1,500.00), at 1.99 % APR for 48 months. Monthly lease payment is $464.78 with $925.00 down payment. First month’s lease payment, security deposit of approximately one month’s payment, retailer administration fee (up to $599.00), MVIC fee ($140.00), A/C levy ($100.00), tire stewardship fee ($16.00), fees associated with PPSA ($89.73), licensing, registration and applicable taxes are extra and due on signing. Total obligation is $24,643.84 plus tax. The residual value of the vehicle at end of term is $17,949.30. Annual kilometers limited to 16,000. $0.15 per excess kilometer. Excess wear-and-tear charges may apply. ***Finance example: Selling price of a 2019 MINI John Cooper Works Clubman ALL4 is $38,965.00, which includes MSRP ($38,190.00) and Freight/PDI ($2,275.00), less credit ($1,500.00), at 0.99 % APR for 60 months requires 120 bi-weekly payments of $303.78 with $450.00 down payment. Cost of borrowing is $1,751.99. Total obligation is $39,941.99. License, registration and taxes are extra and due on signing. ****MSRP starting price for a base model 2019 MINI John Cooper Works Clubman ALL4 is $38,190.00. Freight/PDI ($2,275.00), retailer administration fee (up to $599.00), MVIC fee ($140.00), tire stewardship fee ($16.00), and A/C levy ($100.00) are extra.